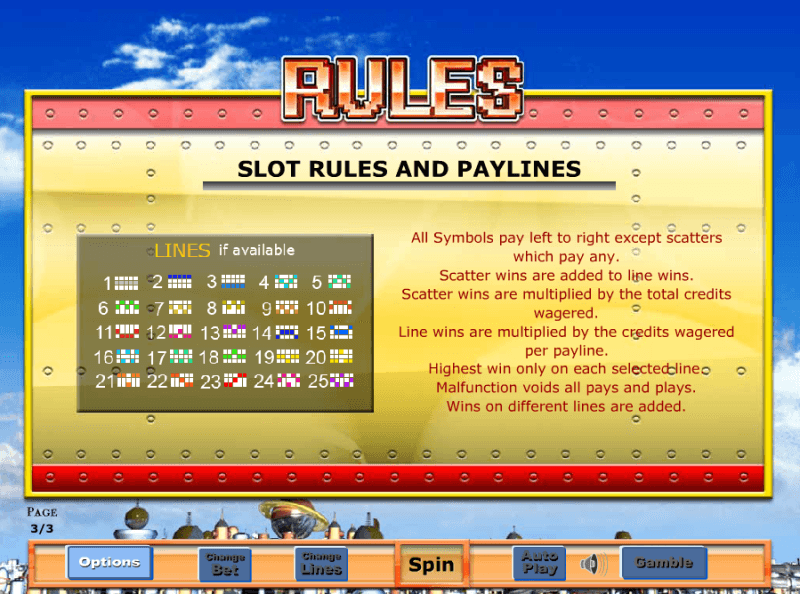 Here's a superb new online slots games. Welcome to Tin Town, a place where even the dogs are robots. These mechanical folk want to help you negotiate the reels and get your hands on some prizes in this top class slot! Springs, batteries, nails, everything you need to make an automaton will pop up as you play Tin Town, a game that revolves around robots. The graphics are fairly simple but all the symbols in Tin Town are all nicely robot themed, Peter Crouch would love this slot machine game! As will anyone who loved robots as a child. Eyecon has a wide portfolio of over 70 games, including its popular Fluffy Favourites. It’s an Australian company that has been developing outstanding online games and multimedia since 1997. This market-leading firm has recently optimised all its games for mobile so it’s easier for the legion of Eyecon fans to play their favourite titles. This forward-thinking move has extended the reach of the developer further and maintained their position as an industry leader. If you love promo's, get the best play slots with bonus spins today. The backdrop to the game is Tin Town, a town made of robot pieces and each of the reels has a riveting background, simple design but effective in transporting you to the robot world. This entertaining slot is a 5 reel, 25 payline slot and you’re looking to get at least 3 of one of the icons in a line to bag a win. 15 icons will appear with each spin, so you’re in with a good shot each time for that to happen. Obviously, the more icons you land, the bigger the win you’ll be rewarded with. Dancebot – No it’s not Peter Crouch, it’s probably the most important symbol in Tin Town. It’s the wild for this game and can take the place of all other symbols, bar the scatter. Get 2 of these in a row and you’ll get 10 coins, which is a modest win, but land 5 of them in a row and you’ll land a whopping 9500 coins! But that’s not where the dancebots power ends. If you have a winning row and screen and the dancebot also appears it will increase your winnings. For example, if you have 5 springs and the dancebot shows up it will increase your win from 100 to 200 coins. Dogbot – What’s better than a robot? A dogbot! 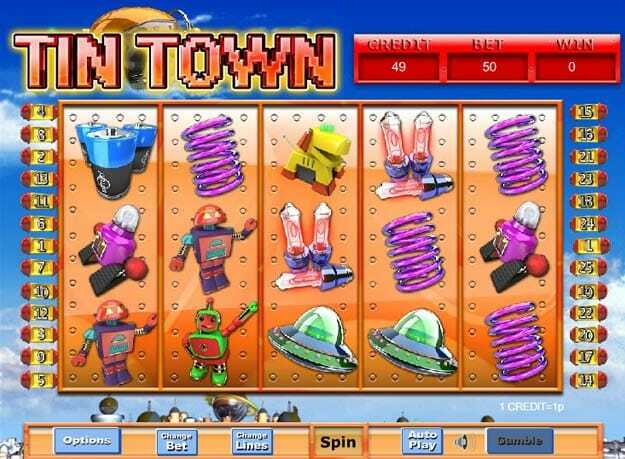 This cute little canine character is the Tin Town scatter and the key to getting free spins. He will trigger 15 free spins when appearing at least 3 times anywhere on the board. When you spin your free plays all the prizes you land are doubled so the dogbot really is a canine friend you’ll want by your side. If you venture to Tin Town you won’t be disappointed, it’s a place where you can spend many happy hours hanging out with dancebot and dogbot and they’ll help you bag some pretty sizeable wins. It’s an easy play, nothing too technical to get your head round, no blockbuster graphics to distract you, just some traditional online slot action with a distinctive and well thought out theme. Don’t forget to bring a couple of treats for dogbot to say thanks for the free spins.